Does the Upwalker Really Work? If you yourself or someone in your home has mobility issues then you know how stressful and inconvenient this can be. You are also probably aware of the many devices that are available to help with this, but one you may not have heard of as yet is the Upwalker. The Upwalker is a mobility device that at first glance appears like many of the standard types of walkers that are on the market. However what makes the Upwalker unique and perhaps more beneficial is the design of it. This mobility device has been designed with some of the additional needs that come with immobility in walking. The promoters of Upwalker are claiming that this device promotes better posture and gives better security because of the way it has been designed. The hype focuses around the Upwalker being clinically tested. 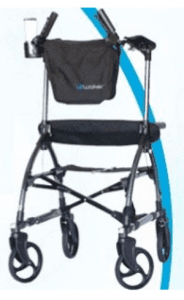 The Upwalker is the newer version of the Lifewalker Upright. This particular device was an award winner. The cost for the Upwalker is $495. While this may seem high it is not unreasonable as there are other types out there that cost more money and do not have the same benefits and features. The commitment for the Upwalker is going to be on the part of the user. They are going to have to learn about all of its benefits such as the adjustable height armrests, lockable brakes,sit to stand handles,and its ability to be used on various types of terrain. The Upwalker has every important feature that is going to make using a device like this all the safer and more comfortable as well as building security in relying on it. While any type of walker will usually afford the user some mobility which they may not normally have many of them come with a lot of drawbacks. Some don’t have the stability to them to allow the user to feel secure. Others are limited with the type of terrain they can be used on. Then an additional problem is that users tend to always look down because of the design of the walkers. These are all major issues that the Upwalker addresses. Just the fact that it can improve posture is a big deal. People that have mobility problems often end up with additional discomfort because of poor posture and the walker they may be using may lend to this. There are a lot of great things to be said about the Upwalker and if you want the best for yourself or for someone who is dealing with mobility problems then this is probably going to be a great choice. We are going to give the Upwalker a thumbs up review even though it is new to market. The Lifewalker Upright which was the previous version of the Upwalker received positive feedback and was considered to be an excellent choice. Aside from all the great features and benefits that the Upwalker possesses the fact that it can give the user some dignity and independence back is a most positive factor. If you are not sure that you are ready to invest the type of money needed to buy the Upwalker then you may want to check out some other alternatives that we have talked about like the Get Up and Go Cane. What do you think? Does Upwalker work or not? Does Dr. Bill's Pressure Care Dental Cleaning System Really Work? Does Magic Ear Work Really Work? Could you recommend a product for a person weighing 350 pounds? My son bought me one for. Christmas. I sent it back unopened on January 5th The said a credit would be issued in 5 days. Today is January 26 and after three phone calls and promises of refund, nothing. Beware of this company. Are you sure they didn’t cedir your son’s credit card? The wheels seem more convenient for walking on grass & thick carpet. Can you get one for $499? Interested in a upwalker . I’m 5”0” tall my phone number is+16232080108.